When making Jupiter observations, it is helpful to make written notes in addition to tape or strip chart recordings. With RJPro's built in observer log the process of making log entries is greatly simplified. The observer log is readily available from its own tool bar button. 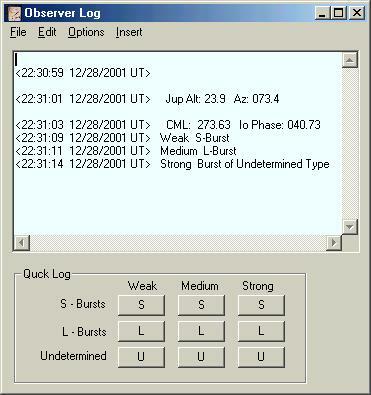 The log is more than a simple text editor, because it allows for quick insertion of computer generated time stamps, Jupiter position information, CML and Io-Phase information, and with the quick log, a way to note burst activity. Even if you are recording on a tape recorder or strip chart, you will find these notes helpful in locating the events in your recordings and charts. The The entire log or the Quick Log is hidable and the log is resizable within limits. You can configure a default log directory under Options. A suggested date related log name is provided during saves.